iNTERNET Turbo® 2012 can prevent TCP/IP protocols data transfer from fragmentation. By using it you can boost your Internet connection performances up to 200% (we also got users’ reports on 300% improvement). iNTERNET Turbo® 2012 saves you time, money and unwanted frustrations. It's a must have tool for anyone who uses an Internet connection and hates having to deal with slow connections and endless buffering. With iNTERNET Turbo® 2012 you can boost any Internet related software activities such as web browsing, downloading files, watching videos, files streaming and sharing and many more.… Moreover it also prevents an undesirable disconnection. iNTERNET Turbo® 2012 is being used by people all over the world and the reviews are amazing. It Includes a very intuitive and simple to operate user interface and a comprehensive help file. 1. Supports all software and hardware adapters. 2. Easily restores the default Windows settings. 3. Automatic wizards to configure Dial-Up/LAN/ISDN/Cable/xDSL and more. 4. A manual mode to configure Dial-Up/LAN/ISDN/Cable/xDSL and more. 5. Includes easy registry backup. 6. Fixes MTU, MSS, TCPWindowSize, SynAttackProtect & KeepAliveInterval. 7. Prevents you from being disconnected by your ISP (Internet Service Provider). 8. Includes a comprehensive help file. 9. Supports Windows 7 / Vista / XP / 2000.
iNTERNET Turbo 2012 can improve your connection speed regardless of the type of connection you are using (Dialup, DSL, LAN, Cable etc.). It’s very hard to configure your connection automatically because there are a lot of different hardware vendors in the market and each computer is a little bit different. 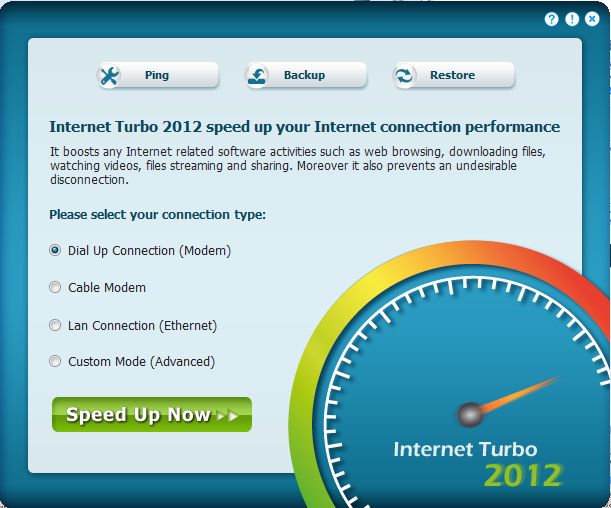 After extensive research, iNTERNET Turbo 2012 offers three different Automatic Optimization Modes which will improve your connection speed. It is recommended that you try all three in order to find out which Automatic Optimization Mode suits your hardware configuration best. If you are unsatisfied with the three Automatic Optimization Mode results you may try the Manual Mode. Since each system is different, there aren’t fixed rules. If you don’t obtain satisfactory results with the Automatic Optimization Modes, you should try various setting combinations. Watch your Internet performance to find out which configuration suits your hardware configuration best. A maximum transmission unit (MTU) is the largest size packet or frame, specified in octets (eight-bit bytes), that can be sent in a packet or frame-based network such as the Internet. The Internet's Transmission Control Protocol (TCP) uses the MTU to determine the maximum size of each packet in any transmission. Too large an MTU size may mean retransmissions if the packet encounters a router that can't handle that large a packet. Too small an MTU size means relatively more header overhead and more acknowledgements that have to be sent and handled. Most computer operating systems provide a default MTU value that is suitable for most users. In general, Internet users should follow the advice of their Internet service provider (ISP) about whether to change the default value and what to change it to. In Windows 95, the default MTU was 1500 octets (eight-bit bytes), partly because this is the Ethernet standard MTU. The Internet de facto standard MTU is 576, but ISPs often suggest using 1500. If you frequently access Web sites that encounter routers with an MTU size of 576, you may want to change to that size. (Apparently some users find that changing the setting to 576 improves performance and others do not find any improvement). The minimum value that an MTU can be set to is 68. As data is routed over the Internet, it must pass through multiple gateway routers. Ideally, each data segment can pass through every router without being fragmented. If the data segment size is too large for any of the routers through which the data passes, the oversize segment(s) are fragmented. This slows down the connection speed as seen by the computer user. In some cases the slowdown is dramatic. The likelihood of such fragmentation can be minimized by keeping the MSS as small as reasonably possible. Determines the maximum TCP receive window size offered. The receive window specifies the number of bytes that a sender can transmit without receiving an acknowledgment. In general, larger receive windows improve performance over high-delay, high-bandwidth networks. For greatest efficiency, the receive window should be an even multiple of the TCP Maximum Segment Size (MSS). The GlobalMaxTcpWindowSize parameter can be used to set the receive window on a per-interface basis. This parameter can be used to set a global limit for the TCP window size on a system-wide basis. When this parameter is set to 1 (true) TCP attempts to discover the Maximum Transmission Unit (MTU), or largest packet size, over the path to a remote host. By discovering the Path MTU (PMTU) and limiting TCP segments to this size, TCP can eliminate fragmentation at routers along the path that connect networks with different MTUs. Fragmentation adversely affects TCP throughput and network congestion. Setting this parameter to 0 (not recommended) causes an MTU of 576 bytes to be used for all connections that are not to destinations on a locally attached subnet. Enables or disables the PMTU discovery mechanism. When PMTU discovery is disabled, TCP connection traffic is sent without setting the Don't Fragment flag to 1. PMTU discovery is enabled by default. Adjusts the PMTU discovery algorithm to attempt to detect PMTU black hole routers. PMTU Black Hole detection is disabled by default. Time-to-live (TTL) is a value in an Internet Protocol (IP) packet that tells a network router whether or not the packet has been in the network too long and should be discarded. For a number of reasons, packets may not get delivered to their destination in a reasonable length of time. For example, a combination of incorrect routing tables could cause a packet to loop endlessly. A solution is to discard the packet after a certain time and send a message to the originator, who can decide whether to resend the packet. The initial TTL value is set, usually by a system default, in an 8-binary digit field of the packet header. The original idea of TTL was that it would specify a certain time span in seconds that, when exhausted, would cause the packet to be discarded. Since each router is required to subtract at least one count from the TTL field, the count is usually used to mean the number of router hops the packet is allowed before it must be discarded. Each router that receives a packet subtracts one from the count in the TTL field. When the count reaches zero, the router detecting it discards the packet and sends an Internet Control Message Protocol (ICMP) message back to the originating host. The default early Windows version TTL value is 32 hops. Some users recommend changing this to 128 if you have difficulty reaching certain sites. Modifying this registry value to 0 prevents the creation of expensive host routes when an ICMP redirect packet is received. Microsoft recommands to configure EnableICMPRedirect entry to 0. Determines how often TCP repeats keep-alive transmissions when no response is received. TCP sends keep-alive transmissions to verify that idle connections are still active. This prevents TCP from inadvertently disconnecting active lines. Determines whether the SYN flooding attack protection feature of TCP/IP is enabled. SYN flooding attack protection is enabled when the value of this entry is 1 and the value of the TcpMaxConnectResponseRetransmissions entry is at least 2 (see note below). The SYN flooding attack protection feature of TCP detects symptoms of denial-of-service attacks (also known as SYN flooding), and it responds by reducing the time the server spends on connection requests that it cannot acknowledge. When set to "1" the SYN flooding attack protection is enabled. When set to "0" the SYN flooding attack protection is not enabled. The maximum number of connections per server returned by the maxConnectionsPerServer property is determined by the HTTP version (1.0 or 1.1) used by the server. This number applies to any Web server connection, not just to downloads. Windows normally limits the number of simultaneous connections made to a single web server. This behavior can be seen in Internet Explorer when downloading multiple files from a web site and only a certain number will be active at any one time. 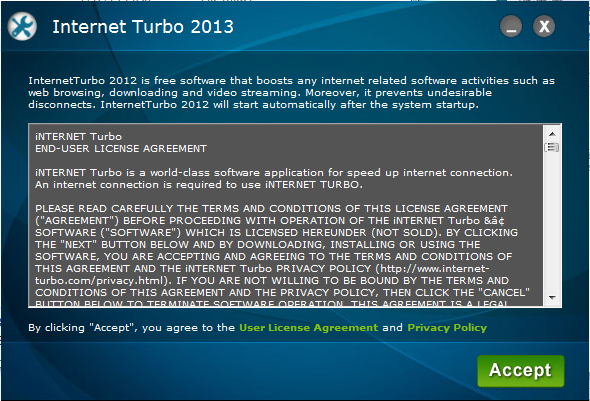 iNTERNET Turbo 2012 includes a "Forever Connected" features which prevents you from being disconnected by your ISP (Internet Service Provider). Most ISPs have some sort of inactivity timeout in which they will disconnect you after a fixed period of time in which your modem is inactive. How many times have you decided to leave your computer for only a few moments and then only come back to find that somehow you are no longer connected? How many times have you begun reading something on the Internet and before finishing you get interrupted by the disconnect dialog box? iNTERNET Turbo 2012 prevents those unwanted disconnections by sending and receiving a data package every fixed period of time. 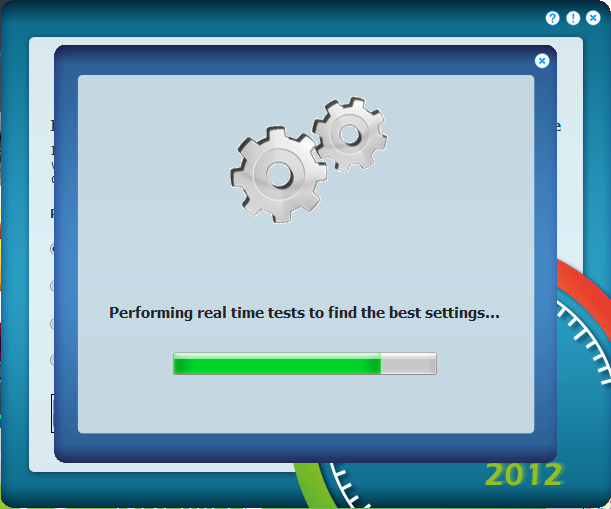 Enter the URL for which iNTERNET Turbo 2012 will simulate activity. For example: http://www.internet-turbo.com (You can also use IP addresses). Choose the desired interval for activity simulation (recommended: 5 minutes). If checked, every time an activity is simulated the program plays a sound. Download the file, then extract it. double click the extracted file, to install it. then select your internet connection type. then click "Speed Up Now>>". then wait until it says "Done". NOTE: if it makes your connection more slower, then restore your settings.